In the 1920s, the popular politician, William Jennings Bryan, began a campaign to bring an end to the teaching of evolution in schools. Bryan argued in 1922: " Now that the legislatures of the various states are in session, I beg to call attention of the legislators to a much needed reform, viz., the elimination of the teaching of atheism and agnosticism from schools, colleges and universities supported by taxation. Under the pretense of teaching science, instructors who draw their salaries from the public treasury are undermining the religious faith of students by substituting belief in Darwinism for belief in the Bible. Our Constitution very properly prohibits the teaching of religion at public expense. The Christian church is divided into many sects, Protestant and Catholic, and it is contrary to the spirit of our institutions, as well as to the written law, to use money raised by taxation for the propagation of sects. In many states they have gone so far as to eliminate the reading of the Bible, although its morals and literature have a value entirely distinct from the religious interpretations variously placed upon the Bible." The American Civil Liberties Union (ACLU) announced that it would finance a test case challenging the constitutionality of this measure. John Thomas Scopes, a teacher at Rhea County High School in Dayton, Tennessee, was approached by engineer and geologist George Rappleyea, and asked if he would be willing to teach evolution at the Rhea County High School. Scopes agreed and was arrested on 5th May, 1925. 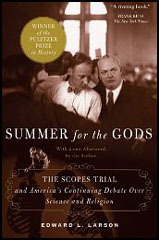 America's most famous criminal lawyer, Clarence Darrow, offered to defend Scopes without a fee. Leading the prosecution was Arthur Thomas Stewart, the District Attorney and he was joined by William Jennings Bryan, who was financed by the World Christian Fundamental Association. The trial began in Dayton on 11th July, 1925. Over 100 journalists arrived in the town to report on the trial. The Chicago Tribune installed its own radio transmitter and it became the first trial in American history to be broadcast to the nation. Three schoolboys testified that they had been present when Scopes had taught evolution in their school. When the judge, John T. Raulston, refused to allow scientists to testify on the truth of evolution, Clarence Darrow called William Jennings Bryan to the witness stand. This became the highlight of the 11 day trial and many independent observers believed that Darrow successfully exposed the flaws in Bryan's arguments during the cross-examination. The jury found John Thomas Scopes guilty and the judge fined him $100. A successful film, Inherit the Wind (1960) was loosly based on the trial. The first element that is necessary is a spirit of tolerance and Christian liberty. When will the world learn that intolerance solves no problems? This is not a lesson which the Fundamentalists alone need to learn; the liberals also need to learn it. Speaking, as I do, from the viewpoint of liberal opinions, let me say that if some young, fresh mind here this morning is holding new ideas, has fought his way through, it may be by intellectual and spiritual struggle, to novel positions, and is tempted to be intolerant about old opinions, offensively to condescend to those who hold them and to be harsh in judgment on them, he may well remember that people who held those old opinions have given the world some of the noblest character and the most rememberable service that it ever has been blessed with, and that we of the younger generation will prove our case best, not by controversial intolerance, but by producing, with our new opinions, something of the depth and strength, nobility and beauty of character that in other times were associated with other thoughts. It was a wise liberal, the most adventurous man of his day - Paul the Apostle - who said, "Knowledge puffeth up, but love buildeth up."